PlayerUnknown’s Battleground, also known as PUBG, has recently issued a mobile version named PUBG Mobile, which is a game published by Tencent Games for iOS and Android devices. Many game enthusiasts have already installed and played it on their phones. Most of the time, players find it convenient to play the game with their iOS and Android devices since they can carry it everywhere at any time of the day. That’s why many people also create a video tutorial of the game to educate the others who got interested in it. However, you might come up with the desire to see the game on a bigger screen and not only on your mobile for a better experience, but you may not have any idea on what screen recorder you can rely on. Luckily, we have tools here that can help you record PUBG Mobile. ApowerREC is a screen recorder for Windows, Mac, and iOS devices such as iPhone and iPad. Based on the built-in screen recording feature of iOS 11, ApowerREC on iOS devices is a free tool that can be used for recording your iPhone/iPad screen, video streaming, video calls and or any other actions you make on your device. Besides, you can record the screen of your device without any limits and watermarks. Also, the recorded videos can be shared via Dropbox, OneDrive, Email and many more options. iOS devices require iOS version 11 for full compatibility. Here is the simple guide on how you can record PUBG Mobile on iOS with ApowerREC. On your iOS device, go to the Apple Store and type in “ApowerREC” on the search bar. Next, tap the “Install” button. When the application installed on your device, launch it. You can also download it directly via clicking the button below. Afterwards, tap the “Recorder” button on the upper left part of the program. Open “Settings” > “Control Center” > “Customize Controls”. After that, tap the “+ Screen Recorder” to add the screen recording feature to the Control Center. When the previous step is done, swipe up the screen to open the Control Center. Firmly press the “Recording” button and choose “ApowerREC”. Tap the “Start Broadcast” to start the recording. At this point you can play the game PUBG Mobile on your phone, and it will be recorded. Finally, when you are done recording, tap the “Stop Broadcast” button to end it. The recorded video will then be saved. Tip: For those who have iOS devices running iOS 10 or below, you can rely on another screen recording tool, named Apowersoft iPhone/iPad Recorder. Just connect your iPhone/iPad and PC to the same WiFi network, then tap “AirPlay” or “AirPlay Mirroring” to mirror your iOS device to PC. 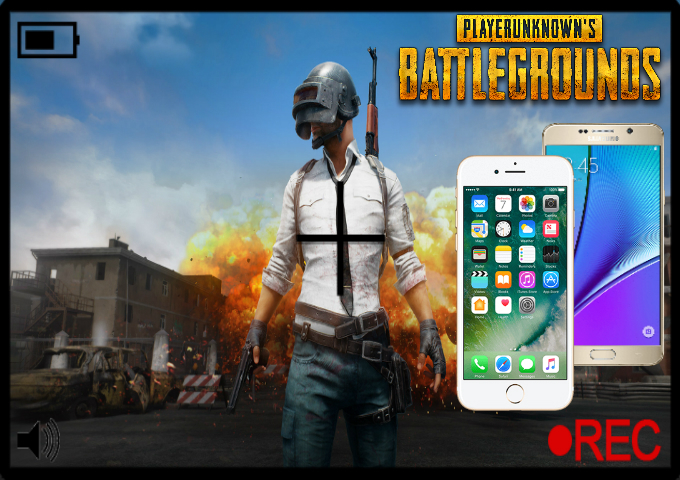 Once mirrored successfully, you can play PUBG Mobile on your iPhone/iPad and record your PUBG Mobile gameplay with this tool. In case you want to record PUBG Mobile on Android in the best way, you may use Apowersoft Screen Recorder. Just like the first application that was mentioned in this article, this is a free screen recorder which supports recording the audio of your device. This tool also allows the recording of different activities on your phone such as tutorials, promotional videos, and a lot more. Apart from that, it enables you to record your PUBG Mobile gameplay using your front camera which is perfect when it comes to recording games. Below are the steps to follow. You need to install the application first by getting it from the Google Play or by hitting the button below. After the installation, run the tool and make some configurations by heading to “Settings”. By doing this you can set the bit-rate, frame rate, orientation, etc. If you like, you can also enable the overlay icon from this section as well as the audio and camera recording. Next, is to open your PUBG game and play as you want. And to end the recording, tap the overlay icon once again, but this time press the “Stop”. The recorded file will then be included on the tool’s media library. In case you need to edit your file, just open the video clip on landscape view and then tap the “Edit” icon located at the upper part of the screen. When the editor is launched, you can start trimming your file and then hit “Edit” to keep the changes made. Moreover, you can also make advantage of the tool’s share function. Long press on a certain video and then tap the “Share” function that appears on the lower left part of the tool. To sum up, you can use iOS ApowerREC for your iOS devices while using Apowersoft Screen Recorder for Android devices. Both tools can be a big help for you to record the PUBG gamelay on mobile devices. And the best part of it is that the recorded gamelay won’t any watermark on it, menawhile, you won’t be bothered by the pop-up ads while using the recorders.